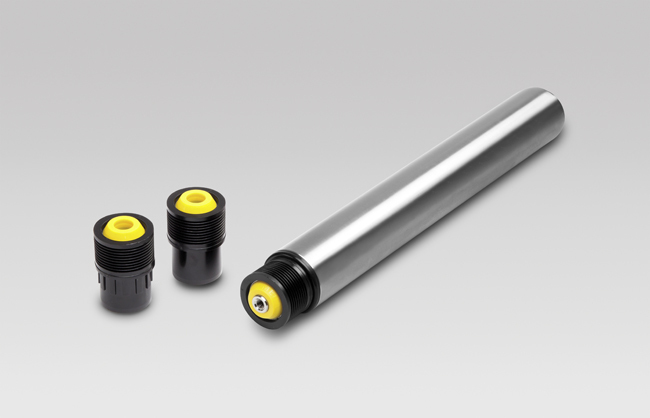 These rollers have the same features as the series 135 (driven) and 138 (friction), but with an interchangeable Poly-V flexible belt head instead of pinion sprockets. The Poly-V belt is a new and effective system. The drive head is made of Polyamide in black colour with 9 grooves for V-rib, pitch 2,34 mm PJ form, ISO 9981 DIN 7867. Standard Poly-V belts have 2 ribs but it is also possible to use belts with 3 or 4 ribs. Even when using elastic belts with only 2 ribs, a transfer of twice the amount as that delivered by comparable round belts is possible. The standard 2-rib belt allows up to 20 rollers to be looped together with a central drive. Achieving a handling speed of up to 1,5 m/s, with low noise levels using driven roller series 135. However, we suggest not exceeding a handling speed of 0,8 m/s with friction roller series 138, due to the friction system and the possibility of units accumulating. The rollers have precision 6002-2RZ ball bearings. In indicating the ordering code, please specify the type, the shaft diameter and execution, the tube diameter and execution, the C length.